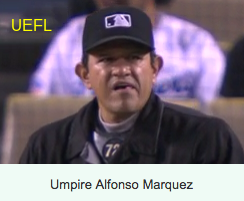 HP Umpire Alfonso Marquez ejected Cubs pitcher Carl Edwards, Jr. (throwing at Mariners batter Austin Nola; QOCU) in the top of the 6th inning of the Mariners-Cubs game. With one out and none on, Mariners batter Kyle Lewis hit a 0-1 pitch from Edwards for a home run. Following a Tim Lopes fly out, subsequent Mariners batter Nola took a 0-0 pitch from Edwards for a hit-by-pitch, the third hit batsman of the game. Video replays are unavailable, the game was not televised, though it was broadcast on radio, the call was irrecusable. * At the time of the ejection, the Cubs were leading, 5-3. The Cubs ultimately won the contest, 6-4. This is Alfonso Marquez (72)'s first ejection of 2019 Spring Training. *Commentary Critique: How does one mispronounce Fonzie's name? See attached audio clip. This is the third ejection of the 2019 preseason. This is the 2nd player ejection of 2019 Spring. Prior to ejection, Edwards' line was 0.2 IP, HR, HBP. This is Chicago's 1st ejection of 2019 Spring, 1st in the Grapefruit League (CHC 1; [All Others] 0). This is Carl Edwards' first ejection since September 8, 2018 (Gabe Morales; QOC = Y [Balls/Strikes]). This is Alfonso Marquez's first ejection since April 24, 2017 (Jeff Banister; QOC = N [Balls/Strikes]).